Truckee’s Caleb Bonneville races to a second place finish at Northstar California Resort on Monday, Feb. 5. 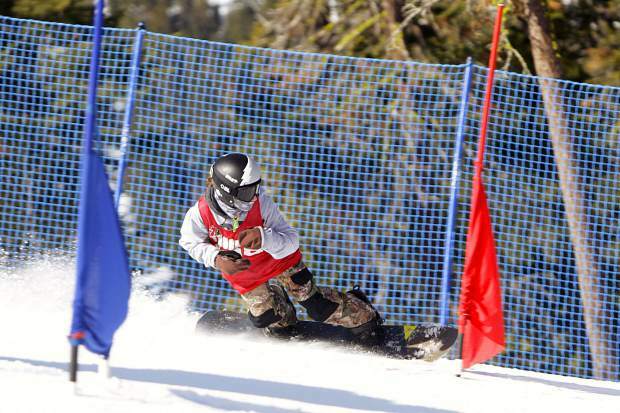 The sun was out and temperatures were high for the fifth round of high school snowboard racing at Northstar California Resort on Monday, Feb. 5. And, as has been the case during most of the season, first place came down to a dual between riders from Placer and Truckee. Placer’s Troy Sheldon and Truckee’s Caleb Bonneville finished nearly five seconds faster than any other rider, but it would be Sheldon taking home the top honors with a first-place time of 1 minute, 10.63 seconds. The course off of Logger’s Loop at Northstar was shortened due to conditions, and presented a difficult layout as the change from soft snow to ice often resulted in racers wiping out. “The key is being early for the gates, making sure you are turning before you are actually at the gate, and also edges and wax,” said Truckee Head Coach Eniko Kuch. Bonneville put together the day’s fastest run on the blue course, finishing with at time of 34.72. Sheldon was second with a time of 35.09, but the Placer rider finished his run on the red course more than half a second faster than Bonneville with a time of 35.54. Bonneville crossed the line with a time of 36.18 to finish with a total time of 1:10.90. Truckee’s Zac Kuch was the next fastest local racer with a total time of 1:19.39 for ninth place. Cali Vail, who finished with a total time of 1:22.25 for 14th place, led North Tahoe. Truckee also had Keenan Sutter (1:22.57), Benjamin Torney (1,22.64), and Tyler Estabrook (1:24.96) all finish in the top 20. Sheldon has now won four races this season, while Bonneville owns a first place finish and three, second places. As a team, Placer finished with 384 points for first place, and the team’s fourth win of the season. Colfax was second with 365 points, followed by Truckee with 362 points. Colfax leads the season standings with 1,863 points, with Truckee in second at 1,830 points. On the girls’ side, Placer’s Skyler Bray picked up her first win of the season with the day’s two fastest runs for a total time of 1:21.48. And North Tahoe’s Nina Burt landed in the top two for the fifth time this year with a total time of 1:23.32. Truckee’s Cassiopeia Dalsey was the team’s only representative, but put together a solid performance for seventh place with a total time of 1:35.38. Truckee was without one of their top competitors in Morgan Just, according to Kuch, due to a concussion. The Placer girls took the team win for the fifth time on the season with 378 points, and lead the regular season standings with 1,871 points. North Tahoe was second with 367 points, followed by Nevada Union in third with 359 points. The snowboarding regular season will conclude on Monday, Feb. 12, at 10 a.m. with another round of giant slalom racing at Northstar. The teams will then prepare for the California Nevada Interscholastic Ski and Snowboard Federation State Championships on March 7-8 at Mammoth Mountain Ski Area.